In 2009, President Barack Obama talked about the US losing its competitive edge, and wanted to increase the college graduation rates. The competition, he said, would come from developing countries like China and India. Manufacturing jobs have mostly gone to China and customer service to India and other Asian countries. More and more private companies have been setting up Research and Development centers in emerging economies where they can find cheap and talented workforce. The public school system are not delivering the results despite the spending (as a percentage of GDP) being higher than other developed countries. Funding to schools are being cut, teachers are being fired, and mediocrity has taken over. The No Child Left Behind Act has also played its part. There are about 3 million students graduating from high school each year. Approximately 70% (2.1 million) are enrolling in college within two years of graduating from school. The total undergraduate enrollment is 17.5 million. Only 57% are completing a bachelor’s degree within 6 years. 43% students fail to complete a bachelor’s degree in 6 years or are dropping out. Per a US News report, 6 of the top 10 universities, 13 of the top 20, and a large proportion of the world’s best universities are located in the US. If the US has the best universities in the world, why are so many students failing to graduate from college? 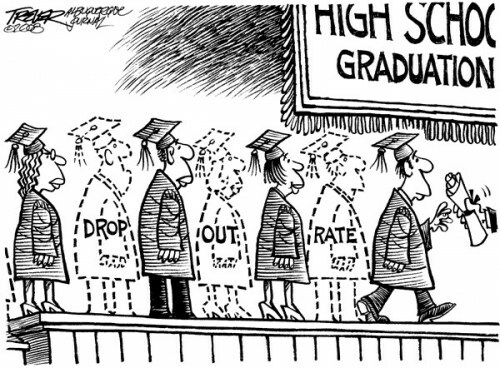 The dropout rate in the US is the highest among the OECD (also the most developed) countries. Here are some interesting facts about college enrollment and graduation rates. This TEDx Women talk was given by my friend and founder of TeachAIDS.org, Dr. Piya Sorcar. We were in the same master’s program at Stanford University. She went on to earn a Ph.D. in Learning Sciences and Technology Design and is committed to improving the lives of millions of people around the world with the innovative use of technology. Named to MIT Technology Review’s TR35 list of the top 35 innovators in the world under 35 in 2011, Dr. Sorcar is the founder and CEO of TeachAIDS, a nonprofit social venture founded at Stanford, which creates breakthrough software used in over 50 countries. Funded by UNICEF, Barclay’s, Google, Yahoo, and other organizations, the TeachAIDS software addresses numerous persistent problems in HIV prevention, and provides the most effective HIV education tools to schools, governments, and NGOs worldwide – for free. Dr. Sorcar began the research to develop TeachAIDS in 2005 as part of her graduate work. Today, she leads a team of world experts in medicine, public health, communications, and education, to develop versions of the software for new languages and cultures. She is the author of numerous articles and has been an invited speaker at many universities, including Caltech, Columbia, Tsinghua, Utrecht and Yale. She holds degrees in Economics, Business and Journalism from the University of Colorado at Boulder, and an M.A. in Education and Ph.D. in Learning Sciences & Technology Design from Stanford University. I’m not a huge fan of standardized tests, but tests are the oldest and most popular method of assessing learning. To some extent, standardized tests do a decent job – they assess if students possess a basic level of knowledge of math, science, and other subjects. Whether applicable in real life or not, these are the rudimentary skills everybody must have. An “educated” Florida school board member with two master’s degrees scored poorly on a math test, and a professor at Union College in Schenectady, NY defended the test. Interesting read. By the way, I answered all questions correctly :). Many are going crazy with the notion that online learning, especially learning with videos, is the answer we have been looking for all these years to address the issues associated with students. Students do not want to study and spend a lot of time in other activities such as video games, TV, and instant messenger/Facebook. If we give them options to learn anytime, anywhere, they will be more likely to study. Videos are like teachers with a rewind button. The students can review the concepts any number of times until they get it. The Khan Academy is doing a great job of providing these videos at no cost to the users. These videos are a wonderful resource for poor students and also to schools for saving money. However, a videos-based online learning solution might not be the answer because they do not take into account how people learn. There is no social context with these videos. What if someone has a question? What if someone is perceiving the instruction in a different way than intended? How do we know if, when, and how much they are learning? The videos can be used to complement a teacher. The teacher teaches in class, then asks the students to watch a few videos for some time, and then do exercises, all under the teacher’s supervision who is always present to answer questions and guide the students. Per a recent New York Times article, it appears that a few schools are using the Khan Academy videos in classrooms and using the analytics to gauge student learning. This is great news and makes my very happy. This is not to say that similar products will have to be used the same way. Older kids and teenagers have longer attention span and realize the importance of learning; however, it’s not going to work for everyone. For students who are motivated to learn, a video-based product or a product with interactive elements may be the right answer we’ve all been looking for. There will always be skeptics (which is a very good thing) but we have to keep moving. In their seminal book Academically Adrift: Limited Learning on College Campuses, the authors Richard Arum and Josipa Roksa analyzed data for more than 2300 students and concluded that the undergraduate students are not learning much in the first two years of college. Their critical thinking, complex reasoning, and writing skills do not show a significant improvement for almost 50% of students as measured by the CLA (Collegiate Learning Assessment). They have presented several reasons including lower socio-economic status of some families, low expectations of instructors, lower standards of teaching and assessment, and on-campus activities. Another major factor for the low performance in college is that their schools didn’t prepare them well for college. The academic requirements progressively get rigorous in college and critical thinking, reasoning, and writing skills become very important in every field of study. In the article Destined to Fail on The Pope Center for Higher Education Policy, the author presents evidence that the schools are not preparing their students for success in college as indicated by the ACT and SAT scores of high school seniors. I’m not a big fan of ACT, SAT, or any standardized test, but ACT, in their benchmark studies, have identified certain test areas (english composition, algebra, and biology) on which a good score is an indicator of their success in similar courses in college. Sounds plausible. This is a shocking statistic. The preparation for college should start in schools, which is not happening. There could be myriad of reasons, but as the blue collar jobs vanish, it is of utmost importance that we prepare our kids in school so that they succeed in college and life.